Forecast: "Could be a bad week for gold"
Result: Gold stabilized during following week. Result: Strong rise in following week. Result: Following week showed breach of upper boundary needing confirmation, followed by complete breakout that led to touching $900 on 1/14/08. Forecast: Dollar "unlikely to pierce resistance zone" between 77.8 and 78.5. Result: Dropped below 75.8 during first week of 2008. Down ever since. Gold had a very nice bounce, and the gold stocks unexpectedly had a huge one. Gold is now back at its upper triangle line, and depending on where you draw your lines (it's an inexact science) it is already showing a mini-breakout from the pattern. That, however, still needs confirmation. Momentum has turned upwards and the RSI shows it has a significant way to go before it goes back into overbought territory. This confirmation could come as soon as Monday, but looking at the 24 hour chart right now, it's too early to tell. The gold stocks have recovered much faster than I expected. There may well still be a good run-up in the cards this week, but I don't dare make any prediction how far it can or will go. The HUI had a big day Friday but could still be putting in the completed right shoulder before sagging off again. 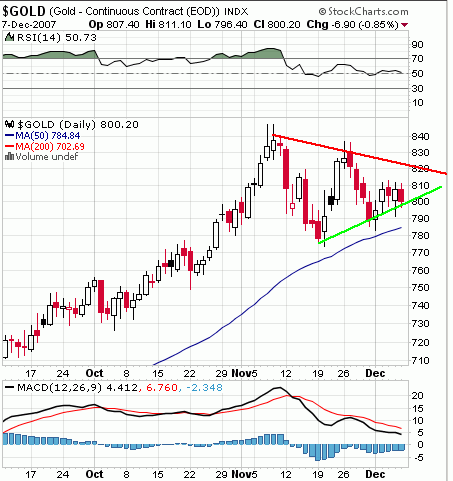 The XAU has entered its resistance zone but hasn't gotten as close to its upper resistance boundary as the HUI has. Both indexes, however, have turned their negative momentum around and arr still below the 50 line on their respective RSI. The dollar index is showing signs of wilting away from its own resistance zone straddling the 78 point level. Its positive momentum is flattening, and it is very close to overbought levels. It appears unlikely to be able to pierce its resistance zone to show further significant advances. Oil is showing signs of turning its early-stage megaphone pattern into an even-sided triangle while hugging its still-rising 50 day moving average. Silver is trying valiantly to climb out of its descending sideways pattern. It had a great week last week, with an unbroken string of advances after a bullish reversal pattern right off its support line at $14 per ounce. Together, all of these developments are rather supportive of gold, and I expect a pretty successful last week of 2007 - barring any last-minute window-dressing shanaigans of the anti-gold crowd. I am still cautious on gold stocks, however. See you next week.Together, all of these developments are rather supportive of gold. I am still cautious on gold stocks, however. If you are concerned about finding the most positively leveraged spot for your investment money, there is no better "spot" for gold investors than the Ron Paul Campaign. Volunteers for Ron paul are conducting reenactments of the Boston Tea Party today, December 16th, and so far over FOUR MILLION DOLLARS have already been donated by his supporters nationwide. It is 4:30 pm CST at the time I write this. The last Ron Paul "Money Bpmb" yielded an unprecedented $4.3 million in a twenty-four hour period on November 5th. We are now on track to exceed that amount in the next hour and will in all likelihood reach our goal of $6 MILLION by 12 pm tonight. That is more than any other candidate from any party in the history of the United States has ever raised in one day. Ron Paul absolutely CAN win! It is up to you to make it happen. Donate now. Donate as much as you can. This is a decisive moment in US history. Nobody in media land expected Ron to get this far. - but he did. Nobody in that sycophantic industry expects him to win the nomination - but he CAN. Whether he will or not depends on you, right now. If you are talking about "return on investment", your $2,300 personal maximum for the primary season can double or triple the dollar-value of your existing gold holdings within a year, and that's probably an understatement. It an also save you a third of your income in taxes. It can restore your privacy, your personal safety from terrorist attacks, our national security, United States sovereignty, and the Constitution and Bill of Rights. Gold started the week out just fine as expected, and then got hit on Thursday and Friday. whn its intra-day low touched the 50 day moving average line. As you can see, in 2006 gold broke down from a much larger consolidation pattern, near $625, only to recover to where we are consolidating now: the $800 level. In keeping with that long term view, I see Friday's mini-breakdown from the smaller green triangle in the chart below as a false breakout. The larger blue triangle has not been violated yet - and even if it eventually is, it will decidedly not spell the end of this great gold bull run. Yes, Indian physical offtake has been weak, but Chinese demand has largely made up for it. US treasury yields are recovering from the recent breakdown (which means treasuries themselves are off their highs), which indicates that inflation concerns are keeping a lid on the Fed's clandestine efforts at buying longer term treasury securities. Perversely, the financial press and economic academia has investors so confused that, in the short term, inflation is now seen as dollar-bullish because it keeps downward pressure on the Fed's policy rates in check. That largely what explains what happened to the dollar on Friday. It remains to be seen how this continues this week. The dollar made a surprise jump in the last two days of after first giving every indication of wanting to slink away from the Dollar Index' blue 50 day moving average line. Suddenly, it touched that line and then decisively broke through on Friday with a huge 1 percent jump. The dollar's chart looks strong, with powerful poistive momentum as indicated by the sharply rising MACD and the positive histograms. Fundamentally, however, there is very little that holds it up. In fact, next to nothing holds it up. The situation addressed last weekend hasn't changed. The euro is now set to put the dollar out of its misery in the foreseeable future, and the Iranians have finally jettisoned even the last vestige fo dollar support by no longer accepting any dollar's whatsoever for their oil. In the meantime, the Fed has lowered both the fed funds rate and discount rate by a quarter point to which the stock markets screamed "WE WANT MORE!!" and went south. Then, on Thursday, some big global central bank liquidity injection gambit was announced and the financial press touted that as "dollar supportive". Yeah right. At the same time oil dropped a little and the 10 year note's yield went up a bit, and the world is supposed to have "fled" to the dollar as a "safe haven bid"??? There is nothing to support the dollar in either the charts or the fundamentals, except maybe pure year-end short-covering. It may well be that this remains to be the case until the new year, but any so-called news bomb about worsening credit conditions or lagging Christmas spending can turn that around in a heartbeat. The XAU and the HUI are now solidly below their 50 day MAs. Out of those two, the HUI shows a serious breakdown pattern. As repeatedly mentioned, the stocks have a huge drag hanging on them like a ball and chain. This comes in the form of rising recovery costs, falling ore grades industry-wide, declining new discoveries, and looming environmental regulations and protest actions. For that reason, the time when gold and gold stocks will part ways is near, but I don't know how near. Paper gold investors do outnumber gold bullion investors to a large degree. The conventional wisdom that a downturn in gold stocks often presages a downturn in gold itself may still holds sway in sufficient investors' minds (especially the institutional kind which never hold old bullion). I would therefore strenuously advocate getting out of all gold stocks and gold mutual funds at this time and park the money somewhere safe. The problem is that money market funds are no longer safe. For a few days or couple of weeks, sure, but beyond that, no one knows. If your stocks are held as part of a mutual fund that funds your 401k or similar account, you may have a problem here since you can't withdraw your funds altogether without incurring large penalties and income tax hits. For those who are in thi situation, I will try and locate a good sector to invest in during the next few days. If you subscribe to our bolg, you know that there possibly is a huge oil find on Gull Island in Alaska that the government has "classified" according to first-hand information from a Baptist minister who was on location during the 1970 when the discovery was made. I am in the proess of filing a FOIA (Freedom of Information Act) request to see if any oil find information was indeed classified during that time. If there was, I would be strongly inclined to believe what Pastor Williams is saying about the find. In that case, oil stocks will plummet, of course - except for those companies who have the recovery rights up there. I will provide more details on that as I get deeper into the subject matter. Even without that, oil prices are likely to deteriorate further because of the megaphone pattern the charts seems to be tracing out at this time. This will tend to undermine gold. It will definitely undermine gold and oil stocks. Stay away from those, for now. The chart hasn't changed much from last week's, so that one is still valid. It seems that treasury yields have bounced off their lows below 4.00 percent and are on the way back up. However, the 'powers' need them to stay low so when a huge amount of ARMs reset next year (mostly subprime, the most endangered category) people won't freak out too badly. Nevertheless, reset they will and at a higher rate, too, because the artificially low teaser-rates used to trap unwary borrowers were just that - artificially low. Therefore it is unclear whether the recent sub-four percent bottom really was a bottom or not, or high they will bounce from here. If the TNX goes through resistance at 4.3 percent, it can bounce quite a bit higher. That would bolster the likely treasuries price breakdown that will come from the jumping price-inflation figures we have seen. At this time it is near impossible to predict what will happen this coming week. The time is critical for the cartels of the world, so all kinds of shenanigans must be expected. I do feel confident about advising to get out of gold mutual funds and stocks in general for now, though. There is a definite, broad-based head and shoulders pattern developing in the HUI, and some gold mutual funds have already fallen off the right shoulder. I will "see" you next week. When looking at the charts alone, things look pretty bleak for gold, its stocks, oil, and silver - but the investment-driven fundamentals are actually quite bullish, at least for the precious metals, even if Indian jewelry demand is really as bad as it's reported to be. Indian imports for October and November fell year over year from around sixty tons each month to 12 and 14 tons, respectively. That's a huge drop. However, China's gold consumption jumped by 24 percent in 2007, causing the country to displace the United States as the world's second largest gold consumer. Unfortunately, China's monthly figures for October and November are not available at this time. The slump in Indian demand probably explains some of the recent weakness in gold and related items, while ythe jump in Chinese demand may explain why the bottom didn't fall out for the year. All in all. although last week's price has held up quite nicely, better than I expected, its trend is toward weakness at least as far as the charts are concerned. Gold stayed just barely above its 20 day moving average ("MA" - blue line) and is tracking it upwards. Friday was a down-day, however, and the closing price touched the green lower boundary of the triangle formation that is showing itself (green line). However, all of this weakness can be reversed in a heartbeat next week. 2. Iran told toled the world it is utterly done with the dollar and won't accept it anymore in trade for oil under any circumstances. In addition to that, the Fed is widely expected to further drop the federal funds rate next week. There is some talk of a 50 basis point cut, while others believe it will be a 25 point cut with a possible 50 point cut in the discount rate. Credit crunch news reports are revealing more and more that the general economy, including small businesses, are definitely affected by the credit collapse. You can see that the last two days of last week have stopped the dollar's bounce just below its 20 day MA and turned it down slightly. When the Fed announces its rate decision next Tuesday, it will drop away further. How far it drops will determine what happens to gold more than anything. We may even get to a gold/oil disconnect. 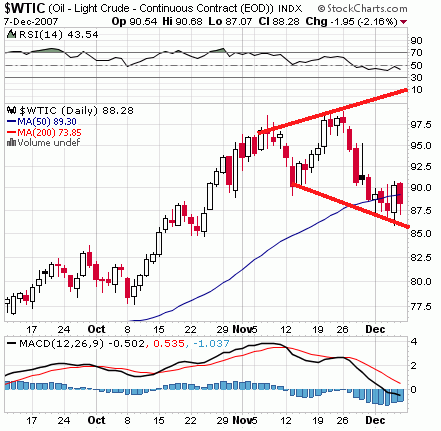 Like the Dow, the WTIC is starting to form its own little megaphone pattern, which is very bearish. There is likely to be more downside to oil than upside in the coming weeks, which would ordinarily tend to depress gold. The dollar developments will determine to what degree that usually strong short-term relationship continues. The Dow,in turn, has had a huge bounce - but it will only serve to confirm its wide-swinging megaphone pattern that will sooner or later break down completely. Stocks cost money, especially overpriced stocks. Where is the money going to come from? Homeowners are maxing out credit cards to keep up woith mortgage payments. Businesses can't get the operating cash they need despite low interest rates. The non-farm payroll numbers were lukewarm at best, and employment figures are so-so as well. Only exporters are making money, but there aren't enough of them left. China's trade surplus is mushrooming all over the place, and they are dealing with their own inflation problems over there. As the credit collapse tightens around the US economy, and as high-finance companies are eating their own guano, who will have the money to invest in stocks so as to drive their prices up? I read a lot of analysts in the gold circuit say the Dow will keep on booming. Sorry. I just don't see that happening. All in all, how the dollar reacts this coming week to the Fed's rate decision will determine much of what happens to gold. The under-performance of gold stocks, however, is weighing heavily on my mind. I may get out of my gold mutual fund this week. But, that's just me. This could be a bad week for gold and silver. Friday last week, gold saw a slow and steady decline in Hong Kong and London that turned into a faster drop once trading opened in New York. This was of course very much aided by the 'opinion' of Goldman Sachs’ chief economist that gold would go down to $750 and that people should sell it. Gold is now sitting right atop its 20 day moving average, as do the HUI, and oil, with the MACD pointing down in all of these. Oil had a bad week as well and closed on Friday at the bottom of the day’s trading range, right on top of its 50 day moving average, with the direction of the MACD as indicated above. Only the XAU has been trading below its 50 day MA last week. I expect mostly a down week, and it could be a brutal one as pointed out by GS. What the purpose of their announcement was is hard to determine at this point. Ordinarily, gold manipulators don’t signal their moves. When they do, you can bet that something is up. Possibly, GS is getting set to make its bullion-banker buddies a small bundle by facilitating a short play on gold to at least partially make up for their serious market losses in the last month. GS over here is like Rothschild in Europe. When they talk about gold, financiers and institutional investors listen. Realize, in all this, that gold will not re-enter its “first gear” channel unless it drops significantly below $700. The $750 target announced by GS is well above that - but it could be a fake out. There is also talk that Indian jewelers consider gold to be “expensive” at current levels and that they have backed off their buying. But developments in the credit and commercial paper markets will determine where gold goes in the short term, and if that goes up significantly, Indian jewelers may well realize that gold still has a long way to go up and is currently actually cheap. All in all, gold’s current breather is well-deserved and is building a new base for the next leg up, I think. Down moves can always be exacerbated by the bullion banks, of course, so caution is in order for those who like to try their hands at trading. If you buy and hold (which is what I always recommend) you are in good shape.